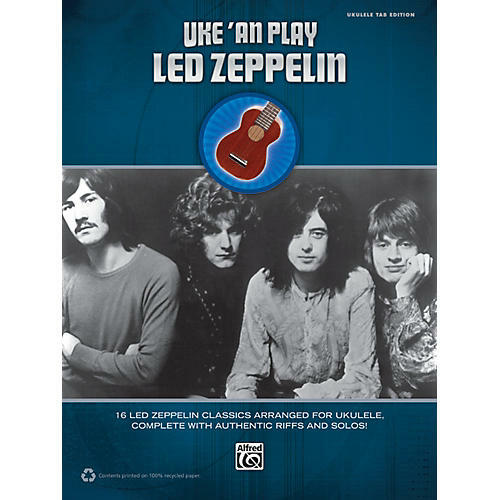 A must-have instructional book for every uke playing Zeppelin fan. Sixteen classic Led Zeppelin songs, with all the guitar parts arranged for ukulele. Titles: Babe I'm Gonna Leave You * Black Dog * Communication Breakdown * D'yer Mak'er * Dancing Days * Good Times Bad Times * Houses of the Holy * Immigrant Song * In the Evening * Kashmir * Living Loving Maid (She's Just a Woman) * The Ocean * Over the Hills and Far Away * Rock and Roll * Stairway to Heaven * Whole Lotta Love.